Millions of children in the United States, including many in Palm Beach County, finish third grade without learning to read proficiently — and that puts them on a dreaded track of dropping out of high school. The ability to read is critical to a child’s success in school, life-long earning potential, and his or her potential to contributing to our nation’s economy and security. Many factors are at play for children to succeed at reading proficiency including the obvious: early literacy education, summer learning, family support, and high-quality teaching. Here’s one that’s not as well noted: school attendance. Attending school regularly helps children feel better about their schoolwork — and themselves. And so, it makes sense that good attendance leads to children doing well later on in high school, college, and at work. For us at Lake Worth West Community Center, a local committee is meeting to address school absenteeism in our community. Our Strong Starts group of residents, business leaders, school administrators, pre-school operators and other stakeholders are looking for local solutions to improve attendance for all students in the area west of Lake Worth – and, with it, raise reading proficiency levels. It’s also a subject our staff and facilitators discuss often with our parents attending our BRIDGES at Lake Worth West programs and events. — One in 10 kindergarten and first-grade students nationally are chronically absent, missing nearly a month of school. Further research shows even higher rates among preschoolers. — Early absences are associated with reading difficulties and poor attendance patterns in later years of life. One study found that only 17 percent of students who were chronically absent in both kindergarten and first grade were reading proficiently in third grade, compared to 64 percent of those with good attendance. 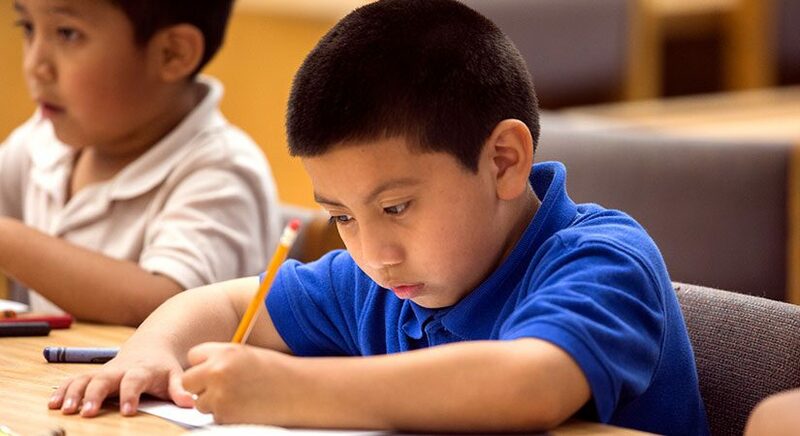 — The effects of poor attendance are particularly hard on low-income children, who need more time in the classroom to master reading and are less likely to have access to resources outside of school to help them catch up. Unfortunately, low-income children are four times more likely to be chronically absent. — Absences can affect the whole classroom if the teacher has to slow down learning to help some children catch up. This research makes a clear case that parents have to understand the consequences of chronic absenteeism and, more importantly, do everything in their power to prevent their children from skipping school regularly. Good attendance habits begin at home with the right messages from parents and caregivers, starting in preschool, so children learn right away that going to school on time is important. Many of our Spanish- and Creole-speaking parents who can’t read or speak English fluently can help their children learn to read simply by getting them to school everyday. — Set a regular bed time and morning routine. — Lay out clothes and pack backpacks the night before. — Don’t let your child stay home unless he/she is truly sick. Keep in mind complaints of a stomach ache or headache can be a sign of anxiety and not a reason to stay home. — Develop back-up plans for getting to school if something comes up. Call on a family member, a neighbor, or another parent. — Avoid medical appointments and extended trips when school is in session. The Lake Worth West Community Center and our partners are working with families to improve school attendance and, at the same time, reading skills. We’re helping families overcome barriers to getting children to class and ensuring that parents know the importance of attendance and the value of a rich and engaging school experience. Carol Clinton is the executive director of Lake Worth West Community Center. Interested in getting involved in our Strong Starts group? Call us at 561-649-9600. Reading proficiency by third grade is the most important predictor of high school graduation and career success, studies show. Yet every year, more than 80 percent of low-income children miss this crucial milestone. Poverty compounds the problem: Students who have lived in poverty are three times more likely to drop out or fail to graduate on time than their more affluent peers. So what can be done? A good place to start is increasing assess to early childhood literacy education. From day one, a child’s brain begins forming connections that build the foundation for all learning he or she will do later in life. In fact, 90% of children’s critical brain development occurs by age 5. Children who are read to, sung to, and talked to from a young age develop bigger vocabularies, become better readers, and are more likely to succeed in school. At Lake Worth West Community Center, programs are offered to develop basic reading skills for children of all ages. They are free and open to the public. Our center’s child development specialist Veronica Callejas explains the importance of early reading and what services are available to families so their children can grow up to become skillful readers. 1) Why is early childhood literacy so important? Veronica Callejas: Early childhood literacy is the stepping-stone for children to prepare for reading and writing readiness. Research indicates that children who enter school with strong oral language skills learn to read and write with greater ease and tend to excel more in school than their peer with less knowledge of vocabulary and language structure. Early childhood literacy develops vocabulary concepts, as children gain information about word meanings and pronunciation. These concepts are first introduced in speaking and understanding other’s speech. It also teaches children the structure of language and the concept that it communicates meaning/information. In turn, children can articulate their words and thoughts clearly. 2) Why is it particularly vital to new immigrants settling in our community? Veronica Callejas: It is particularly vital for new immigrants to have these programs/workshops available because their children are growing up in households where they are hearing and speaking a non-English language, so that makes it harder for new student immigrants to learn. Thus, these children have less exposure to English in their earliest years and will be challenged by their language skills upon entering school. Children, as well as their parents, need socio-emotional support. Early childhood education is tied to everything a child will face and accomplish in his or her future years, including social situations and practices. 3) What kind of early literacy programs/workshops are offered at Lake Worth West Community Center and BRIDGES at Lake Worth West? Storytime by Palm Beach County Library. There’s also have programs in the homes of children between the ages of 2 and 4. These are offered by Literacy Coalition of Palm Beach County and PCHP (Parent Child Home Program). Visit our activities calendar by clicking here to see the schedules for these and other upcoming programs and events. Or call us at 561-649-9600. To help support our early literacy programs, please consider a donation to our center. Learn more here.